After formulating the question, we need to match it to the appropriate evaluation design. When developing an evaluation, we need to consider rigour and feasibility. Selection of our evaluation strategy also depends on whether we want to enhance local knowledge or provide generalizable information on the validity of the KT intervention. Those interested in local applicability of knowledge should use the most rigourous study design feasible. Those interested in generalizable knowledge should use the most rigorous research evaluation design that they can afford, such as randomized trials. A third form of evaluation to consider is process evaluation. Process evaluation may involve determining the extent to which target decision makers were actually exposed to the intervention or the dose of the intervention. It may also include a description of the experience of those exposed to the intervention and potential barriers to the intervention. This type of evaluation is also useful for identifying changes that should be made to the intervention or implementation strategy based on what is revealed. We believe that process evaluation should occur alongside observational and experimental evaluation. 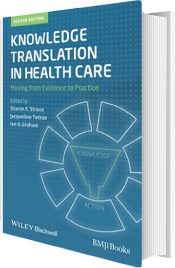 Qualitative methods of evaluation can be helpful in exploring the “active ingredients” of a KT intervention and thus are particularly useful in process evaluation. Triangulation should be considered in qualitative studies whereby a variety of strategies for data collection are used to enhance validity. Qualitative research can also be useful for identifying unintended impacts of the intervention. Quantitative evaluation methods include randomized and quasi-experimental studies. Randomized trials are more logistically demanding but provide more reliable results than do non-randomized studies. Non-randomized studies can often be implemented more easily and are appropriate when randomization is not possible. Mixed methods can be used to evaluate KT interventions and are particularly helpful in evaluating complex KT interventions.